HAGERSTOWN, MD (March 19, 2019) – Affordable family fun returns to historic Municipal Stadium this season as the Hagerstown Suns, Class-A affiliate of the Washington Nationals, present a season full of promotions, deals and giveaways during their 70 home games against South Atlantic League competition. 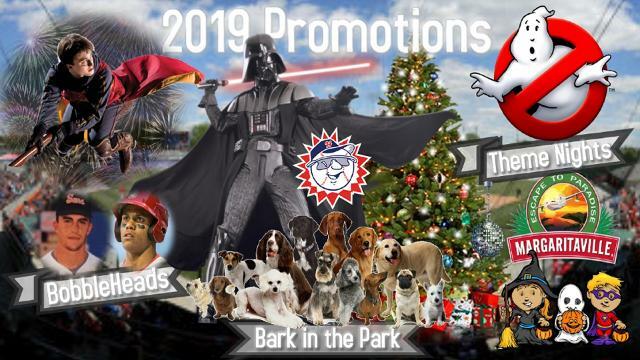 June is filled with events from Harry Potter night to Ghostbusters/80’s night and Halfway to Christmas June 29, which includes a special Christmas Ornament giveaway. July events include our Pre-July 4 event July 3, Margaritaville night and a Summer Halloween party. July 20, the Suns will host the first of three Bobblehead Giveaways with the first 1,000 fans receiving a Mike Mussina Hall of Fame inspired bobblehead. Other bobblehead giveaways includ 2018 National League Rookie of the Year Runner-Up Juan Soto and the Hagerstown/Washington County CVB’s annual Mystery Bobblehead.